Audrey J. Weiss, Ph.D., Marguerite L. Barrett, M.S., and Claudia A. Steiner, M.D., M.P.H. In this HCUP Statistical Brief, we use historical HCUP inpatient data from 2003 through 2011 along with early 2012 data from nine HCUP States to develop national projections of 2012 and 2013 hospital costs and other inpatient statistics for all hospitalizations (any reason). We examine five distinct hospital service lines that together encompass all types of inpatient discharges: medical, surgical, injury, mental health, and maternal and neonatal. Differences greater than 10 percent between annual weighted estimates are noted in the text. Because analyses in this Statistical Brief are based on all discharges from all States weighted to a national level, the values may differ slightly from results reported from the HCUP Nationwide Inpatient Sample (NIS). Table 1 summarizes the average hospital costs, total discharges, and average length of stay for all inpatient hospitalizations and hospitalizations for five component hospital service lines in 2003 and 2011 (actual values) and for 2013 (projected values). The average annual percentage change from 2003 to 2011 (actual change) and from 2011 to 2013 (projected change) is presented. In the past decade, average inflation-adjusted hospital costs for all discharges combined grew by 2 percent annually, while total hospital discharges and average length of a hospital stay remained relatively stable. Average hospital costs (in 2013 dollars) increased from $9,100 in 2003 to $10,600 in 2011, and they are projected to be $11,000 in 2013. Total hospital discharges remained relatively stable at 37 to 38 million discharges per year. The average length of a hospital stay remained relatively stable at 4.7 to 4.8 days, and it is projected to be 4.6 days in 2013. Across five general types of hospital service lines, average hospital costs grew by more than 2 percent on average per year for three: surgical, injury, and maternal and neonatal hospitalizations. Discharge volume changed relatively little for all hospital service lines except mental health, which grew by more than 1 percent on average per year. Average length of stay decreased slightly for all hospital service lines except maternal and neonatal, which had slight growth. The most costly hospital stays were for surgery and injury (projected at $22,500 and $15,100, respectively, in 2013). Discharge volume was highest for medical stays, projected at 17.8 million in 2013 (about half of all stays). Length of stay was longest for mental health and shortest for maternal and neonatal (projected at 6.7 and 3.2 days, respectively, in 2013). Note: Inflation-adjusted costs are presented in 2013 dollars. Average hospital costs increased by 2 percent per year between 2003 and 2011, and they are projected to continue to increase at about this same rate through 2013. Average hospital costs, which were adjusted for inflation, increased by an average of 2.0 percent per year between 2003 and 2011. These costs are projected to continue to increase at about this same rate per year (1.9 percent) through 2013. In 2003, average hospital costs (in 2013 dollars) were $9,100, and they are projected to reach $11,000 per stay in 2013. Average hospital costs grew for all hospital service lines. Between 2003 and 2011, hospital costs grew by more than 2 percent per year for three service lines: maternal and neonatal (2.5 percent), surgical (2.4 percent), and injury (2.2 percent). Total hospital discharges remained relatively stable between 2003 and 2011, and they are projected to decrease slightly through 2013. The overall number of hospital discharges changed minimally at 0.1 percent average annual growth between 2003 and 2011. Discharges are projected to decrease by an average of 0.5 percent per year from 2011 through 2013. There were 37.4 million total hospital discharges in 2003, and this is projected to be virtually unchanged in 2013 at 37.3 million discharges. Four of the five hospital service lines experienced relatively little change in hospital discharges between 2003 and 2011, ranging from -0.7 percent average change per year for maternal and neonatal discharges to 0.6 percent average change per year for medical discharges. Only mental health discharges experienced noteworthy growth at 1.9 percent per year, which is projected to continue at 1.4 percent growth per year through 2013. The other service lines are expected to experience a slight to moderate decrease in discharges. Average length of stay remained relatively stable between 2003 and 2011, and it is projected to decrease somewhat through 2013. The average length of a hospital stay changed minimally at -0.1 percent average change per year from 2003 through 2011. Length of stay is projected to decrease by an average of 0.8 percent per year from 2011 through 2013. In 2003, the average length of a hospital stay was 4.8 days; this is projected to be 4.6 days in 2013. Four of the five hospital service lines—medical, surgical, injury, and mental health—experienced a slight decrease in length of stay between 2003 and 2011, which is projected to continue or decrease further through 2013. Only the maternal and neonatal service line experienced an increase in the length of stay, from 3.0 days in 2003 to 3.2 days in 2011 (0.6 percent annual growth); the average length of stay is also projected at 3.2 days in 2013 (0.4 percent annual growth). Figures 1-3 show the 2003-2013 actual and projected trend in average hospital costs (Figure 1), total discharges (Figure 2), and average length of stay (Figure 3) for the five hospital service lines. Note: Inflation-adjusted costs are presented in fourth quarter 2013 dollars. Source: Agency for Healthcare Research and Quality (AHRQ), Center for Delivery, Organization, and Markets, Healthcare Cost and Utilization Project (HCUP), State Inpatient Databases (SID), 2003-2011, and early State data, 2012. Figure 1. Average hospital costs (inflation-adjusted) by service line, quarterly values 2003-2013. Figure 1 is a line graph showing the slope of the observed changes in average total hospital costs in dollars per quarter from 2003 through 2011 and projected costs for 2012 and 2013. Inflation-adjusted costs are presented in fourth quarter 2013 dollars. Observed medical-related hospital costs began at 7896 in 2003 and increased slightly across time, ending at 9238 in 2011. Costs are projected to increase to 9566 by the end of 2013. Observed surgical-related hospital costs were the highest. They began at 17468 in 2003 and rose steadily to 21761 in 2011. Costs are projected to increase to 22943 by the end of 2013. Observed injury-related hospital costs began at 11825 in 2003 and increased across time, ending at 14928 in 2011. Costs are projected to increase to 15541 by the end of 2013. Observed mental health-related hospital costs began at 5781 in 2003 and increased slightly across time, ending at 6535 in 2011. Costs are projected to increase to 6708 by the end of 2013. Observed maternal and neonatal-related hospital costs were the lowest. Observed costs began at 3460 in 2003 and rose slightly across time, ending at 4373 in 2011. Costs are projected to increase to 4566 by the end of 2013. Source: Agency for Healthcare Research and Quality (AHRQ), Center for Delivery, Organization, and Markets, Healthcare Cost and Utilization Project (HCUP), State Inpatient Databases (SID), 2003-2011, and early State data, 2012. Average hospital costs were highest for the surgical service line and lowest for the maternal and neonatal service line. Average hospital costs, adjusted for inflation, differed substantially by hospital service line. The surgical service line had the highest costs (in 2013 dollars) at $17,600 in 2003, which are projected to be $22,500 in 2013. The injury service line had the second-highest hospital costs overall at $12,100 in 2003, which are projected to be $15,100 in 2013. The other three service lines had average hospital costs below $10,000: medical ($9,400 projected in 2013), mental health ($6,600 projected in 2013), and maternal and neonatal ($4,500 projected in 2013). Figure 2. Total discharges by service line, quarterly values 2003-2013. Figure 2 is a line graph showing the slope of the observed changes in the number of total discharges per quarter from 2003 through 2011 and the projected number of total discharges for 2012 and 2013. The numbers of observed medical-related hospital discharges were the highest. They began at 4326189 in 2003 and remained stable across time, aside from some seasonal variations. The number of discharges in quarter 1 was consistently higher than the numbers in other quarters. There were 4351442 discharges at the end of 2011. The number of discharges is projected to be 4394703 by the end of 2013. The number of observed surgical-related hospital discharges began at 1983800 in 2003 and decreased slightly across time, ending at 1915677 in 2011. The number of discharges is projected to decrease to 1857773 by the end of 2013. The number of observed injury-related hospital discharges began at 407776 in 2003 and rose slightly across time, ending at 438474 in 2011. The number of discharges is projected to continue to remain stable at 439357 by the end of 2013. The number of observed mental health-related hospital discharges began at 444307 in 2003 and rose slightly across time, ending at 516328 in 2011. The number of discharges is projected to increase slightly to 531086 by the end of 2013. 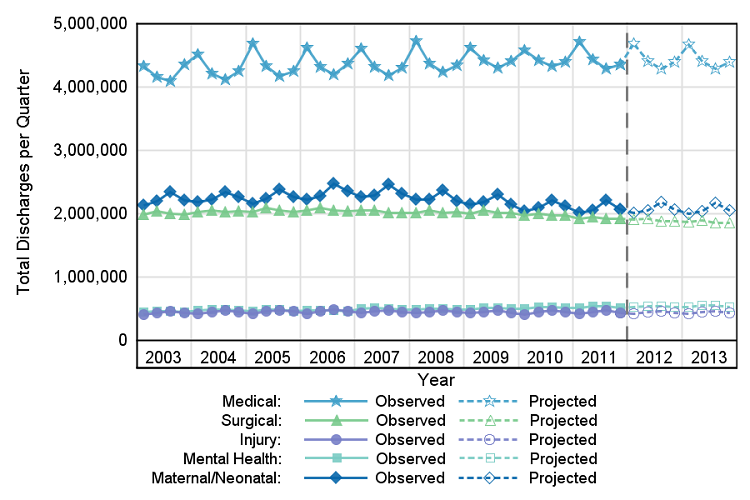 The number of observed maternal and neonatal-related hospital discharges began at 2128606 in 2003 and decreased slightly across time, with some seasonal variations. The number of discharges in quarter 3 was consistently slightly higher than the numbers in other quarters. There were 2072615 discharges at the end of 2011. The number of discharges is projected to be 2048566 by the end of 2013. Source: Agency for Healthcare Research and Quality (AHRQ), Center for Delivery, Organization, and Markets, Healthcare Cost and Utilization Project (HCUP), State Inpatient Databases (SID), 2003-2011, and early State data, 2012. Total discharges were highest for the medical service line and lowest for the injury and mental health service lines. The medical service line had the highest number of hospital discharges overall. Although there was some seasonal data fluctuation, it averaged around 16 to 17 million total discharges per year (4 to 4.5 million discharges per quarter). The surgical and maternal and neonatal service lines each had about 8 million total discharges per year (around 2 million discharges per quarter). The mental health and injury service lines had the fewest discharges at approximately 1.8 to 2 million discharges per year (400,000 to 450,000 discharges per quarter). Figure 3. Average length of stay by service line, quarterly values 2003-2013. Figure 3 is a line graph showing the slope of the observed changes in the average length of stay in days per quarter from 2003 through 2011 and the projected number of total discharges for 2012 and 2013. The average length of medical-related hospital stays was the longest. They began at 4.9 days and were stable across time, ending at 4.7 in 2011. The projected average length of these hospital stays continues to be stable, ending at 4.6 days in 2013. The average length of surgical-related hospital stays began at 5.9 and was stable across time, ending at 5.5 in 2011. The projected average length of these hospital stays continues to be stable, ending at 5.5 in 2013. The average length of injury-related hospital stays began at 5.1 and was stable across time, ending at 4.9 in 2011. The projected average length of these hospital stays continues to be stable, ending at 4.8 in 2013. The average length of mental health-related hospital stays began at 7.5 and declined slightly across time, ending at 6.9 in 2011. The projected average length of these hospital stays is projected to continue a slight decline, ending at 6.8 in 2013. The average length of maternal and neonatal-related hospital stays was the shortest. They began at 3.1 and were stable across time, ending at 3.2 in 2011. The projected average length of these hospital stays continues to be stable, ending at 3.2 in 2013. Source: Agency for Healthcare Research and Quality (AHRQ), Center for Delivery, Organization, and Markets, Healthcare Cost and Utilization Project (HCUP), State Inpatient Databases (SID), 2003-2011, and early State data, 2012. Average length of stay was longest for the mental health service line and shortest for the maternal and neonatal service line. The average length of a hospital stay was longest for the mental health service line at 7.4 days in 2003, which is projected to continue to be the longest at 6.7 days in 2013. The surgical service line had a length of stay of 5.8 days in 2003, which is projected to be 5.5 days in 2013. The medical and injury service lines had similar lengths of stay around 4.9 to 5.0 days in 2003, which are projected to be about 4.6 to 4.7 days in 2013. 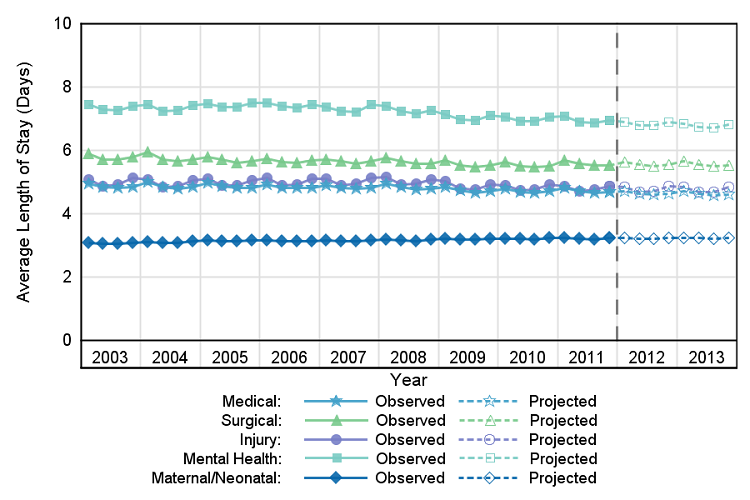 The maternal and neonatal service line had the shortest length of stay at around 3.0 days in 2003, which is projected to continue to be the shortest at 3.2 days in 2013. The estimates in this Statistical Brief are based upon data from the Healthcare Cost and Utilization Project (HCUP) State Inpatient Databases (SID) for 2003 through 2011. The SID from 2003 through 2011 include about 305 million inpatient discharges from 47 States. At the time these statistics were generated, we had early quarterly data for nine States for 2012. The 2012 projections incorporated observed rates for these nine States and estimated rates from time-series models for the remaining States. For 2013, the projections were entirely based on rates estimated from time-series models. National quarterly projections for 2012 and 2013 were generated using the SAS Time Series Forecasting System™ (Version 9.2).5 Projections were calculated first by State and then weighted proportionally to the nine Census divisions and the nation. For each State, the software automatically selected from among 40 different time series models the model with the lowest mean absolute percentage error (MAPE) for that State. National quarterly trends were calculated as a weighted average of the State-level quarterly trends within each division. Each State's weight was proportional to its total number of discharges (excluding newborns) as reported in the American Hospital Association (AHA) Annual Survey of Hospitals. These AHA-based weights were used throughout the period, 2003-2012. Coding criteria for the five hospital service lines are provided in Table 2 and are based on International Classification of Diseases, Ninth Revision, Clinical Modification (ICD-9-CM) codes, Clinical Classifications Software (CCS) categories, and diagnosis-related groups (DRGs) (see definitions below). Each discharge was assigned to a single hospital service line hierarchically, based on the following order: maternal and neonatal, mental health, injury, surgical, and medical. ICD-9-CM assigns numeric codes to diagnoses. There are approximately 14,000 ICD-9-CM diagnosis codes. CCS categorizes ICD-9-CM diagnoses into a manageable number of clinically meaningful categories.6 This "clinical grouper" makes it easier to quickly understand patterns of diagnoses. CCS categories identified as "Other" typically are not reported; these categories include miscellaneous, otherwise unclassifiable diagnoses that may be difficult to interpret as a group. DRGs comprise a patient classification system that categorizes patients into groups that are clinically coherent and homogeneous with respect to resource use. DRGs group patients according to diagnosis, type of treatment (procedures), age, and other relevant criteria. Each hospital stay has one assigned DRG. Injuries are identified using the principal diagnosis and a scheme recommended by Safe States Alliance, which was previously known as the State and Territorial Injury Prevention Directors Association (STIPDA). The table below lists the diagnosis codes in the range 800-999 used to identify injuries. 800-909.2, 909.4, 909.9: Fractures; dislocations; sprains and strains; intracranial injury; internal injury of thorax, abdomen, and pelvis; open wound of the head, neck, trunk, upper limb, and lower limb; injury to blood vessels; late effects of injury, poisoning, toxic effects, and other external causes, excluding those of complications of surgical and medical care and drugs, medicinal or biological substances. 910-994.9: Superficial injury; contusion; crushing injury; effects of foreign body entering through orifice; burns; injury to nerves and spinal cord; traumatic complications and unspecified injuries; poisoning and toxic effects of substances; other and unspecified effects of external causes. 995.80-995.85: Adult maltreatment, unspecified; adult physical abuse; adult emotional/ psychological abuse; adult sexual abuse; adult neglect (nutritional); other adult abuse and neglect. 909.3, 909.5: Late effect of complications of surgical and medical care and late effects of adverse effects of drug, medicinal, or biological substance. 995.0-995.4, 995.6-995.7, 995.86, 995.89: Other anaphylactic shock; angioneurotic edema; unspecified adverse effect of drug, medicinal and biological substance; allergy, unspecified; shock due to anesthesia; anaphylactic shock due to adverse food reaction; malignant hyperpyrexia or hypothermia due to anesthesia. 996-999: Complications of surgical and medical care, not elsewhere classified. CCS = 661 (Substance-related disorders): diagnoses 96500 (poisoning by opium), 96501 (poisoning by heroin), 96502 (poisoning by methadone), 96509 (poisoning by other opiate). Because of the hierarchical ordering used to assign discharges to service lines, discharges with one of these five principal diagnosis codes were assigned to the mental health service line and not the injury service line. Surgical stays are identified by a surgical DRG. The DRG grouper first assigns the discharge to a major diagnostic category (MDC) based on the principal diagnosis. For each MDC, there is a list of procedure codes that qualify as operating room procedures. If the discharge involves an operating room procedure, it is assigned to one of the surgical DRGs within the MDC category; otherwise, it is assigned to a medical DRG. Medical stays are identified by a medical DRG. The DRG grouper first assigns the discharge to an MDC, based on the principal diagnosis. For each MDC, there is a list of procedure codes that qualify as operating room procedures. If the discharge involves an operating room procedure, it is assigned to one of the surgical DRGs within the MDC category; otherwise, it is assigned to a medical DRG. Average annual percentage change is calculated using the following formula: Average annual percentage change equals open bracket, open parenthesis, end value divided by beginning value, close parenthesis, to the power of 1 divided by change in years, minus 1, close bracket, multiplied by 100. HCUP is based on data from community hospitals, which are defined as short-term, non-Federal, general, and other hospitals, excluding hospital units of other institutions (e.g., prisons). HCUP data include obstetrics and gynecology, otolaryngology, orthopedic, cancer, pediatric, public, and academic medical hospitals. Excluded are long-term care, rehabilitation, psychiatric, and alcoholism and chemical dependency hospitals. However, if a patient received long-term care, rehabilitation, or treatment for psychiatric or chemical dependency conditions in a community hospital, the discharge record for that stay will be included in the State Inpatient Databases (SID). The unit of analysis is the hospital discharge (i.e., the hospital stay), not a person or patient. This means that a person who is admitted to the hospital multiple times in one year will be counted each time as a separate "discharge" from the hospital. Total hospital charges were converted to costs using HCUP Cost-to-Charge Ratios (CCRs) based on hospital accounting reports from the Centers for Medicare & Medicaid Services (CMS).7 Costs will reflect the actual expenses incurred in the production of hospital services, such as wages, supplies, and utility costs; charges represent the amount a hospital billed for the case. For each hospital, a hospital-specific CCR is used. The CCRs are at the hospital level and are not sensitive to possible differences by hospital service line. Hospital charges reflect the amount the hospital billed for the entire hospital stay and do not include professional (physician) fees. For the purposes of this Statistical Brief, costs are reported to the nearest hundred. Quarterly cost data from the HCUP Projections8 were weighted to produce annual costs. Quarterly and annual costs were inflation adjusted using the Gross Domestic Product (GDP) from the U.S. Department of Commerce, Bureau of Economic Analysis (BEA), with either the 2013 annual (Table 1) or 2013 fourth quarterly value (Figure 1) as the index base.9 That is, all costs are expressed in 2013 dollars. The Healthcare Cost and Utilization Project (HCUP, pronounced "H-Cup") is a family of health care databases and related software tools and products developed through a Federal-State-Industry partnership and sponsored by the Agency for Healthcare Research and Quality (AHRQ). HCUP databases bring together the data collection efforts of State data organizations, hospital associations, private data organizations, and the Federal government to create a national information resource of encounter-level health care data (HCUP Partners). HCUP includes the largest collection of longitudinal hospital care data in the United States, with all-payer, encounter-level information beginning in 1988. These databases enable research on a broad range of health policy issues, including cost and quality of health services, medical practice patterns, access to health care programs, and outcomes of treatments at the national, State, and local market levels. HCUP Statistical Briefs are descriptive summary reports presenting statistics on hospital inpatient and emergency department use and costs, quality of care, access to care, medical conditions, procedures, patient populations, and other topics. The reports use HCUP administrative health care data. The HCUP State Inpatient Databases (SID) are hospital inpatient databases from data organizations participating in HCUP. The SID contain the universe of the inpatient discharge abstracts in the participating HCUP States, translated into a uniform format to facilitate multistate comparisons and analyses. Together, the SID encompass more than 95 percent of all U.S. community hospital discharges in 2009. The SID can be used to investigate questions unique to one State, to compare data from two or more States, to conduct market-area variation analyses, and to identify State-specific trends in inpatient care utilization, access, charges, and outcomes. For additional HCUP statistics, visit HCUPnet, our interactive query system, at http://hcupnet.ahrq.gov/. Introduction to the HCUP State Inpatient Databases. Online. August 2013. U.S. Agency for Healthcare Research and Quality. http://hcup-us.ahrq.gov/db/state/siddist/Introduction_to_SID.pdf. Accessed December 13, 2013. Weiss AJ (Truven Health Analytics), Barrett ML (M.L. Barrett, Inc.), Steiner CA (AHRQ). 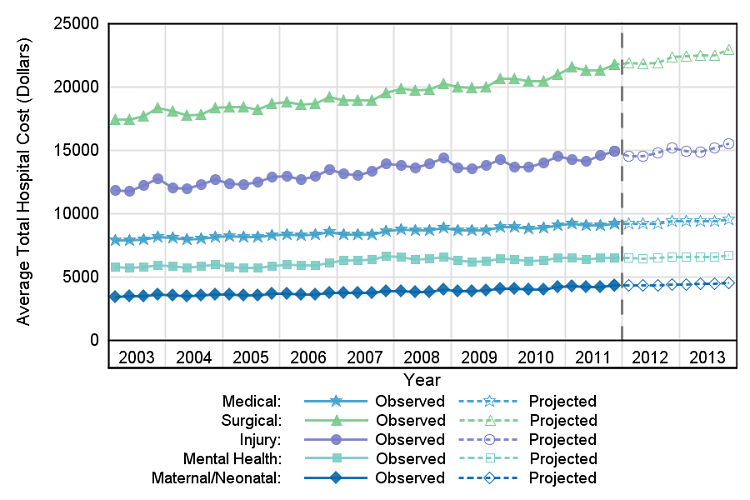 Trends and Projections in Inpatient Hospital Costs and Utilization, 2003-2013. HCUP Statistical Brief #175. July 2014. Agency for Healthcare Research and Quality, Rockville, MD. http://www.hcup-us.ahrq.gov/reports/statbriefs/sb175-Hospital-Cost-Utilization-Projections-2013.pdf. The authors would like to acknowledge the contributions of Clare Sun of Truven Health Analytics. 1 Gonzalez JM. National health care expenses in the U.S. civilian noninstitutionalized population, 2011. MEPS Statistical Brief #425. November 2013. Agency for Healthcare Research and Quality, Rockville, MD. http://meps.ahrq.gov/data_files/publications/st425/stat425.pdf. Accessed March 28, 2014. 2 Pfuntner A, Wier LM, Steiner C. Costs for hospital stays in the United States, 2011. HCUP Statistical Brief #168. December 2013. Agency for Healthcare Research and Quality, Rockville, MD. http://www.hcup-us.ahrq.gov/reports/statbriefs/sb168-Hospital-Costs-United-States-2011.pdf. Accessed January 28, 2014. 4 Complete and detailed description, methodology, data, and projections are provided in: Steiner C, Andrews R, Barrett M, Weiss A. HCUP Projections: Cost of Inpatient Discharges 2012 to 2013. HCUP Projections Report #2013-01. December 11, 2013. Agency for Healthcare Research and Quality: Rockville, MD. http://www.hcup-us.ahrq.gov/reports/projections/2013-01.pdf. Accessed January 31, 2014. 5 SAS Institute. Large-Scale Automatic Forecasting Using Inputs and Calendar Events. White Paper, SAS Institute Inc., 2009. 6 HCUP Clinical Classifications Software (CCS). Healthcare Cost and Utilization Project (HCUP). U.S. Agency for Healthcare Research and Quality, Rockville, MD. Updated April 2014. http://www.hcup-us.ahrq.gov/toolssoftware/ccs/ccs.jsp. Accessed May 29, 2014. 7 HCUP Cost-to-Charge Ratio (CCR) Files. Healthcare Cost and Utilization Project (HCUP). 2001-2011. U.S. Agency for Healthcare Research and Quality, Rockville, MD. Updated August 2013. http://www.hcup-us.ahrq.gov/db/state/costtocharge.jsp. Accessed May 29, 2014. 8 Steiner C, Andrews R, Barrett M, Weiss A. HCUP Projections: Cost of Inpatient Discharges 2012 to 2013. HCUP Projections Report #2013-01. December 11, 2013. Agency for Healthcare Research and Quality, Rockville, MD. http://www.hcup-us.ahrq.gov/reports/projections/2013-01.pdf. Accessed January 31, 2014. 9 U.S. Bureau of Economic Analysis. National Income and Product Account Tables, Table 1.1.4 Price Indexes for Gross Domestic Product. http://www.bea.gov/iTable/iTable.cfm?ReqID=9&step=1#reqid=9&step=1&isuri=1. Accessed March 20, 2014. Internet Citation: Statistical Brief #175. Healthcare Cost and Utilization Project (HCUP). June 2014. Agency for Healthcare Research and Quality, Rockville, MD. www.hcup-us.ahrq.gov/reports/statbriefs/sb175-Hospital-Cost-Utilization-Projections-2013.jsp.